Jägermeister (/ˈjeɪɡərˌmaɪstər/, YAY-gər-my-stər, German: [ˈjɛːɡɐˌmaɪstɐ], stylized Jägermeiſter) is a digestif made with 56 herbs and spices at a strength of 35% alcohol by volume (61 degrees proof, or US 70 proof). It is the flagship product of Mast-Jägermeister SE, headquartered in Wolfenbüttel, south of Braunschweig, Lower Saxony, Germany. The history of Jägermeister starts with Wilhelm Mast, a vinegar-manufacturer and wine-trader in the city of Wolfenbüttel, Germany. His son, Curt Mast (1897-1970), was passionate about the production of spirits and liqueurs, and always keen to help his father in the business even at an early age. At the age of 37, after he successfully took over his father's business, Curt Mast finally came up with the recipe for his new herbal liqueur, which he called "Jägermeister", in 1934. Curt Mast, the original distiller of Jägermeister and son of the founder Wilhelm, was an enthusiastic hunter. The name Jägermeister in German literally means "Hunter Master", "Hunt Master" or "master of the hunt". It is a title for a high-ranking official in charge of matters related to hunting and gamekeeping. The term Jägermeister had existed as a job title for many centuries. In 1934 the new Reichsjagdgesetz (Reich Hunting Law) re-defined the term, applying it to senior foresters, game wardens, and gamekeepers in the German civil service. Hermann Göring was appointed Reichsjägermeister (Reich Hunting Master) when the new hunting-law was introduced. Thus, when Jägermeister was introduced in 1935, its name was already familiar to Germans—who sometimes called the product "Göring-Schnaps". Jägermeister came to greater international attention particularly through the work of Sidney Frank (1919-2006), who ran an American liquor-importing company. From the 1980s he promoted the drink in the youth and student market, as a drink for parties - a quite different niche to its traditional conservative brand-position in its German market. New York magazine quoted a market research firm as describing him as a "promotional genius" for making "a liqueur with an unpronounceable name...drunk by older, blue-collar Germans as an after-dinner digestive aid...synonymous with 'party'". The Mast-Jägermeister company ultimately purchased Sidney Frank Importing in 2015. In 2012 Jägermeister launched premixed drinks as a brand extension. The drinks come in two flavours, "raw" and "ginger lime". The company recommends that Jägermeister be kept on ice and served cold, and suggests that it be kept in a freezer at −18 °C (0 °F) or on tap between −15 and −11 °C (5 and 12 °F). Contrary to a rumor that has circulated on the internet, Jägermeister does not contain deer blood or elk blood. An icon of Saint Hubertus depicting his vision of a cross between the antlers of a stag. The label on Jägermeister bottles features a glowing Christian cross seen between the antlers of a stag. This image is a reference to the two Christian patron saints of hunters, Saint Hubertus and Saint Eustace, both of whom converted to Christianity after experiencing a vision in which they saw a Christian cross between the antlers of a stag. In the product name on the label is one of the few surviving examples of the use of the long s in print. The label contains the following verse from the poem Weidmannsheil, by the forester, hunter, and ornithologist Oskar von Riesenthal; von Riesenthal is not credited on the label. And through the beast to God is true. A shot glass of Jägermeister dropped into a glass of Red Bull energy drink makes a cocktail called a Jägerbomb. 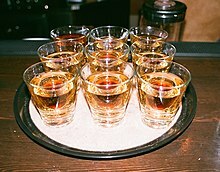 A Liquid Heroin is a shooter made with one part Rumple Minze, one part Jägermeister, and one part Bacardi 151 rum. Alternatively, a Liquid Cocaine is made with one part Goldschläger, one part Jägermeister, and one part Bacardi 151 rum. A Surfer on Acid is made with equal parts of Jägermeister, Malibu, and pineapple juice. A Tart's Delight is made with equal parts of Jägermeister, Fernet Branca, and gin, garnished with several SweeTarts (green preferred). A Bob Dylan is a shot of Jägermeister with Surge. The Four Horsemen of the Apocalypse is a shot made with equal parts Jägermeister, Rumple Minze, Goldschläger, and Bacardi 151. Starry Night shot consists of ​2⁄3 shot of Jägermeister and ​1⁄3 shot of Goldschläger. From the 1970s, the Jägermeister brand has developed an association with motor racing, as they have sponsored various European racing teams, primarily those who fielded BMWs and Porsches. These teams have competed in various major racing series including Formula One (March and EuroBrun), DRM (Max Moritz, Kremer, Zakspeed), DTM and Group C (Brun Motorsport), who took the team title in the 1986 World Sportscar Championship. Jägermeister's orange livery is one of the more commonly recognised in motorsport. The Spanish Fly slot car brand has recently brought out model cars with the distinctive design. More recently, they introduced the Naylor Racing NHRA Pro Stock car, minus its signature orange livery. The livery's notability was proven when an article in the January 31, 2008, edition of Autosport listed it as one of the twenty most iconic commercial colour schemes. Jägermeister is associated with German football, especially the Bundesliga. In 1973, Eintracht Braunschweig became the first Bundesliga team to place a sponsor's logo on its jersey, although the team rejected a related proposal to rename itself Eintracht Jägermeister. The sponsorship, very controversial at the time, paid the team 100,000 DM (€51,130) and introduced a new way of doing business in football. Other teams quickly followed suit. Jägermeister now displays its advertisements at several football stadiums in Germany. Jägermeister also had an involvement in European table tennis when it sponsored German club TTC Jägermeister Calw and was a personal sponsor of Dragutin Šurbek. As of 2018 Jägermeister has sponsored the National Hockey League (NHL) as the Official shot of the NHL. 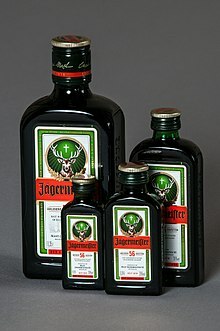 In the United States, Jägermeister became popular through promotion by Sidney Frank and through its association with heavy metal and rock music bands such as Murphy's Law, Halestorm, Metallica, Mötley Crüe, Pantera, Slayer, HIM, Crossfaith, Epica, The Bloodhound Gang, Psychostick, and Turbonegro. Jägermeister is the tour sponsor of numerous bands of this genre. Jägermeister has been a sponsor of the second stage at the Rockstar Mayhem Festival since 2008. Mayhem Fest is a large Hard Rock and Modern Metal festival that tours the United States and Canada. In 2008 the stage featured the bands Machine Head, Airbourne, Five Finger Death Punch and Walls of Jericho. The 2009 Mayhem Fest Jäger Stage featured Trivium, All That Remains and God Forbid. The 2010 stage featured the bands Hatebreed, Chimaira, Shadows Fall and Winds of Plague. The 2011 stage featured Unearth, Kingdom of Sorrow, and Red Fang. The 2012 stage featured Anthrax, Asking Alexandria, and more. The Jägermeister Music Tour, which is owned by Sidney Frank Importing, is an event that is held each year in the spring and fall. In Australia, Jägermeister sponsors the AIR Charts, which are Australia's official independent music charts (run by the Australian Independent Record Labels Association). ^ "Jägermeister". www.jagermeister.com. Retrieved 13 October 2017. ^ "Jägermeister". Jager.com. Archived from the original on 2011-08-07. Retrieved 2011-09-16. ^ "the definition of jagermeister". Dictionary.com. Archived from the original on 2017-10-11. Retrieved 13 October 2017. ^ Coffey, Helen; Morris, Hugh; Lee, Kieran (27 March 2014). "Jaegermeister: 12 facts about everyone's favourite après drink". The Daily Telegraph. Retrieved 19 November 2014. ^ Chris Redman (February 20, 2011). "Flying Sky High: Grey Goose Vodka". France Today. Retrieved October 3, 2013. ^ Seth Stevenson (2004). "The Cocktail Creationist". New York Magazine. Retrieved October 1, 2013. ^ Hopkins, Amy. "Jägermeister acquires Sidney Frank". The Spirits Business. Retrieved 17 October 2015. ^ "Jagermeister's first ever brand extension". The Shout. 2013-07-21. Archived from the original on 2013-09-18. Retrieved 2013-08-13. ^ a b Barbara Mikkelson (2011-05-26). "Blood in Jagermeister". Snopes.com. Retrieved 2011-09-16. ^ a b Difford, Simon (September 2007). Cocktails: Over 2250 Cocktails. diffordsguide. p. 388. ISBN 9780955627606. Retrieved 28 November 2012. The logo has a deer with a cross between its antlers, recalling a vision in the life of St Hubert, the patron saint of hunters. ^ British Archaeological Association (1878). The Archaeological journal. Longman, Brown, Green, and Longman. p. 281. Retrieved 28 November 2012. Hubert and Eustace are very similar, though the period of their conversions was nearly 600 years apart. 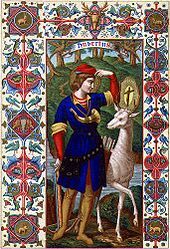 Both saints were of noble birth and passionately devoted to the chase, and both were converted by an encounter with a milk white stag, bearing a crucifix between its horns. ^ College Weekend. BJ Klein. October 2010. p. 66. ISBN 9780557711697. Retrieved 28 November 2012. The Jägermeister logo, which shows the head of a stag with a glowing cross between its antlers, is a reference to the stories of Saint Hubertus and Saint Eustace. ^ Justice, Monkey. "Jägerbomb Drink Recipe". Drink Nation. Retrieved 2013-08-13. ^ "How to make a Liquid Heroin". LiquidHeroin.com. Retrieved 2015-01-04. ^ "Surfer on Acid Recipe". About.com. 2015-01-04. ^ "Unique Cocktail Garnish Ideas". Pinterest. 2016-06-10. ^ "Four Horsemen of the Apocalypse drink recipe". Drink Nation. Retrieved 2016-06-13. ^ "Starry Night Shot drink recipe". Drink Nation. Retrieved 2016-06-13. ^ "Exoto's Racing Legends — Porsche 934 RSR/935 Turbo Jägermeister Gift Set". exoto.com. Retrieved 2011-09-16. ^ Metallica and the Story of Thrash: Metal Hammer Special, dated July 2008, pp. 56–59. ^ "Jägermusic.com". Jagermusic.com. Retrieved 2011-09-16. ^ a b "Updated: Official Rockstar Energy Drink Mayhem FestivalDetails Revealed". Roadrunnerrecords.com. 2011-01-31. Archived from the original on 2011-03-10. Retrieved 2011-09-16. ^ "2008 Rockstar Mayhem Festival – Lineup, Dates and Tickets". Cantstoprockin.com. 2008-06-11. Retrieved 2011-09-16. ^ "Slayer & Marilyn Manson to headline Mayhem Fest 2009 – Full Lineup and Itinerary". Metal Injection. 2009-01-27. Retrieved 2011-09-16. ^ Lucas, Sindy (2010-01-20). "2010 Rockstar Mayhem Festival Bands Announced". Thesilvertongueonline.com. Archived from the original on 2011-07-17. Retrieved 2011-09-16. ^ "Rockstar Mayhem Festival 2011". Archived from the original on 2011-03-08. Retrieved 2011-09-16. ^ "Welcome to the Jägermeister Air Charts!". Aircharts.com.au. 2011-08-21. Archived from the original on 2009-06-21. Retrieved 2013-08-13. Wikimedia Commons has media related to Jägermeister.